It can be attached to the bottom of the patrol pack by passing the stiffened webbing straps with the female side release buckles through the four webbing keepers on the bottom of the patrol pack. It can be attached directly to the FLC by utilizing the stiffened webbing tabbs on back woven in to the corresponding slots on the back of the FLC. It can be carried in the "stand alone" configuration by utilizing the attached two inch wide waist belt. 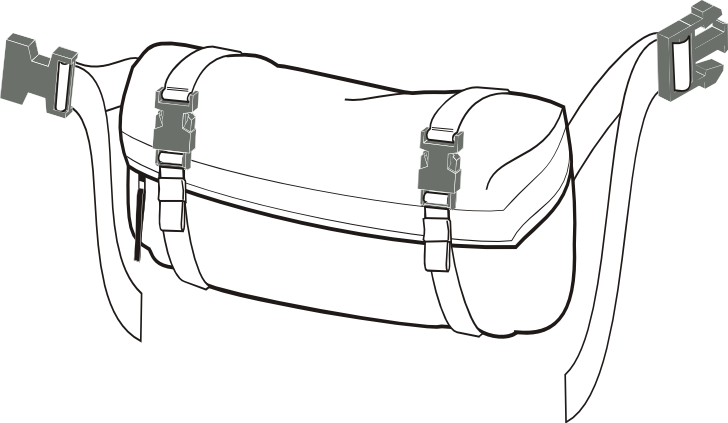 This method allows the user to rotate the waist pack around in front to easily access the contents of the pack without removing the FLC or patrol pack. When not used in this mode, the attached waist belt is stowed into the tunnel on back of the waist pack. It can also be attached directly to the main pack by passing the side release buckle and straps through the webbing below the claymore pouch on the main pack.